September 2002; Since the Concord RG25 battery in my plane was nearly four years old, I decided to make a preemptive strike and replace it before it died at a bad time/location. Battery technology has progressed quite a bit since I bought the Concord back in 1998, so I went a different direction this time. Bob Nuckolls of "AeroElectric Connection" (don't even consider wiring your plane without reading this book first!) advocates a sealed battery (recombinant gas) of 17ah capacity which gets replaced every two years. This results is a low battery cost per year but guarantees there will always be a relatively fresh battery onboard. It seems 17ah is enough honk to crank just about any Lycoming. I ran some searches for sealed lead acid batteries of this size and found a Panasonic at DigiKey: run a search for P174-ND. The actual Panasonic model number is LC-R1217P. My old Concord cost nearly $130; the new battery is much smaller and cost.............. $36.95! There are many similar batteries under different brands, but the point is that there is no reason to spend more than about $40 for a battery. At this price, we can afford to replace the things every couple of years if necessary. Since the new battery is so much smaller than the Concord (and can be mounted in any position without a box) I am moving the battery forward of the firewall. I have built a "tray" that holds the battery in a "vertical" orientation on the right side of the firewall. This means all contactors and stuff will be forward of the firewall with no fat wires penetrating the firewall. My RV-6 first flew with a remote oil filter mount which was subsequently removed, but the firewall reinforcements remained and as luck would have it, were in precisely the correct location to secure the battery tray. I think the cable ties will be just fine in the engine compartment, but I can see them through the oil door during preflight inspection and should be able to catch a failure in plenty of time if it occurs. The battery spins the old Prestolite starter (and the SkyTec lightweight starter) just as readily as the Concord, so it appears this will be a reliable installation. Update January 2004: The Panasonic battery has now been in service for about sixteen months and 130 flight hours, this being its second winter. It has faithfully cranked the O-320.......until a recent January morning. The plane sat out on a cold, windy ramp, and in the process of attempting to start the primerless cold-soaked engine, I managed to get it flooded. The chilled battery pooped out after several attempts to start the engine, and I resorted to using jumper cables. The battery recharged just fine but I went ahead and replaced it with a fresh unit. This time I used the Panasonic LC-X1220P which has the same size case and terminals, a rating of 20ah, and costs about $7 more than the 17ah battery. The old 17ah battery is still being used more than two years later for powering the hangar COM receiver. By the way, the nylon cables ties look brand new after nearly two years in the engine compartment. Based on my experience with the el cheapo battery, I think you will receive good service from this battery and similar units if your plane is based in a mild climate. If you are based where you need to start the engine in near-freezing or colder temps, you will probably be better served with the Odyssey PC680 or one of its cousins. I suspect the Odyssey will provide more reserve punch in low temps for those times you need to turn a bunch of blades to get the fire lit. 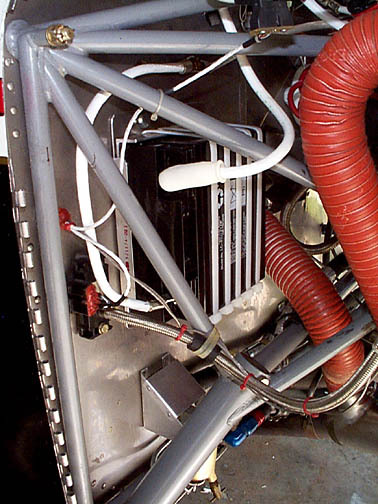 One more factor to consider is the type of starter on the plane and the length and size of the battery cables. Some of the compact starters pull a tremendous amount of current and may be more than the el cheapo battery can handle on a consistent basis in cold weather. Also, if the battery cables are long or undersized, the battery performance may be compromised. Update March 2006: Even though the Panasonic 20ah battery is still working fine, it's two-year lease is up. Since the price of Odyssey batteries has steadily fallen the past few years, the PC680 is sometimes available on E-Bay for only a few dollars more than a new Panasonic. It was an easy decision to install a new PC680 this cycle, and if it lasts at least three years, which it should, its cost per year will be comparable to the Panasonic. The case dimensions of the two batteries are identical, so the PC680 readily slipped into the existing battery mount.